Banker: How can I help you young man? 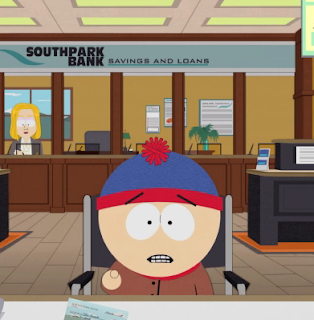 Stan: I got a hundred dollar check from my grandma and my Dad said I should put it in the bank so it can grow over the years. Banker: Well thats fantastic, a really smart decision young man. We can put that check in a money market mutual fund that will reinvest the earnings into foreign currency accounts with compound interest... and it's gone. Catch the full episode for some "gallows" humor.